Although we are a relatively young company, we bring over 75 years of combined experience to your project. Our workers are friendly, conscientious, talented and well trained. Experience is an important part of our business, but we feel it is also imperative that we stay up to date with the latest in technology, coatings (both interior and exterior), detergents, and chemicals that are currently available. We believe in being prompt to the job, good communication with our customers, and making sure the project is completed as scheduled. The customer is always #1. We strive for customer satisfaction and callbacks for your future projects. 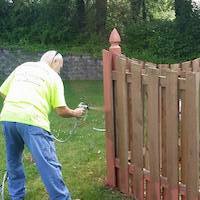 Interior house painting, exterior house painting, staining, cedar siding repair, deck refinishing, fence refinishing, power washing, and roof cleaning are all available with us. Airless spraying, HVLP spraying, roller, and brush painting are all available. We now use a low pressure method of washing vinyl siding which is much safer for your home than using high pressure. We proudly feature Benjamin Moore and Sherwin Williams painting products. In our exterior washing services we use only professional grade products. PaintBusters is fully insured for your peace of mind. We have done interior and exterior painting and power washing in Maryville, Collinsville, Caseyville, Alton, Godfrey, Bethalto, East Alton, O'Fallon, Belleville, Aviston, Carlyle, Fairview Heights, Swansea, Granite City, Madison, Glen Carbon, Edwardsville, Hamel, Staunton, New Baden, Freeburg, Alhambra, Highland, St. Jacob, Marine, and Troy, Illinois. We have also worked in St. Louis, St. Peters, Weldon Springs, Eldon, Russellville, St. Martins, and Jefferson City, MO.